Published on 29. 07. 2012 in comics and cartooning, culture, current affairs, film, tv, video, hype & linkage, journal and pictorial arts. Closed Tags: Aurora shooting, Batman, Christopher Nolan, copyright, Frank Miller, Gemäldegalerie, ImageText, IP, James Holmes, SJoCA, William Noel. James Holmes who killed 12 people and wounded 58 last Friday at the midnight screening of The Dark Knight Rises in Aurora, Colorado was quickly christened the ‘Batman Killer’ in Danish media. Just one of those shortcuts the tabloids trade in, I suppose — it’s far from clear whether the gunman chose what movie to shoot up because of its content and it is, of course, a moot question to ask of such a tragedy. If anything, one might ask the whether it makes any sense at all that 100-round drums for full automatics can still be ordered on the internet, no questions asked. Or why this statistic, which speaks volumes as to the causality between gun ownership and gun fatality, remains acceptable for Americans. 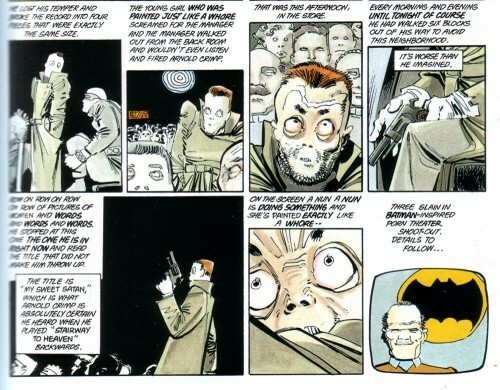 For somebody familiar with Dark Knight director Christopher Nolan’s comics sources, it seemed at least a little bit poignant that Frank Miller anticipated the Aurora massacre in the seminal Dark Knight Returns (1986). Appearing in a sequence detailing Batman-inspired vigilantism, it is to Miller’s credit that he here mocks the media’s tendency to jump to conclusions about the causality between fictional and actual crime, while clearly acknowledging that it exists. Petition to prevent the substitution of old master paintings with modern ones at the Berlin Gemäldegalerie. These plans for a radical reorganisation of the Berlin galleries would spoil one of the world’s best galleries and be a sad concession to the popular preference for modern art. Surely some other solution can be found? Please consider signing. William Noel of the Walters Art Gallery on why sharing digital images of their collections online is good business and just the right thing to do for museums. It remains an uphill battle, but it seems things are changing re: museums hoarding the IP they’ve been given to share with the public. New issues of academic journals on comics. Recently published, the first issue of the Scandinavian Journal of Comic Art is worth a look. As is the newest issue of ImageText.